Have you ever received an email from either your personal bank or a bank that you have no account? Or have you every received an email from yourself, that was threatening? Perhaps you received an email from a company that you've done business with that is unexpected or seems fishy. That's because it is...it is most likely a Phishing E-mail Scam. 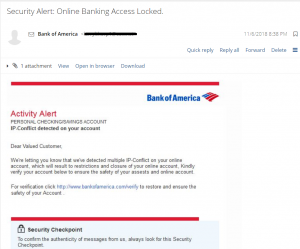 So what can you do to avoid phishing e-mail scams? Phishing is when a scammer uses fake emails or text messages in order to get you to share your personal valuable information – such as account numbers, login ID’s and passwords. Scammers will use this information to steal your money, your identity or both. Another use for these phishing emails is to gain access to your computer or network. If you click on a link, they can install programs such as ransomware that can lock you out of your data. These scammers often use familiar company names such as Netflix or Bank of America. The email will claim that there is either an issue with your billing or they detected multiple IP-Conflicts on your online account. You are then advised to contact them to update your payment information or to verify your account to restore it. 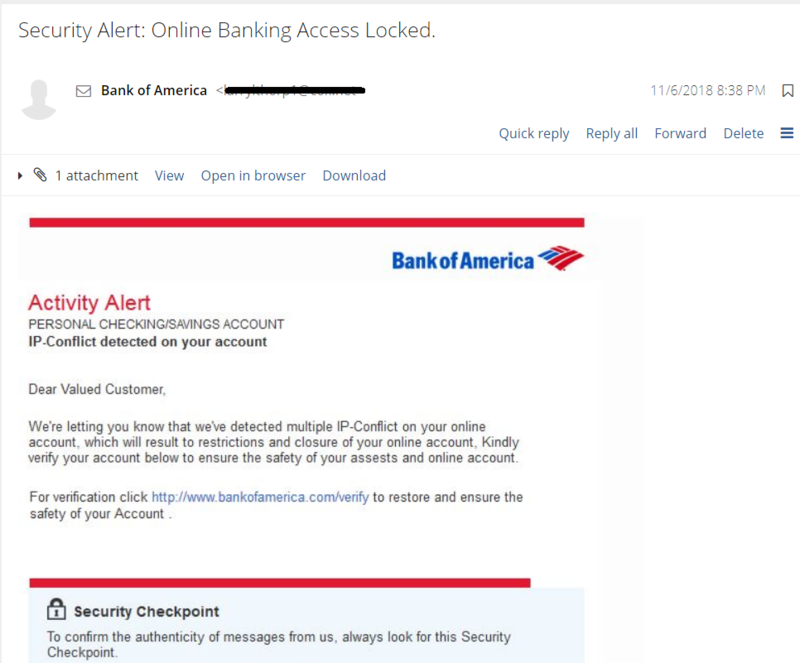 Another recent scam is that the email appears to come from the victims own email account. In this spoofing attempt, the scammers instruct you to send a ransom in the form of bitcoin. Being that the email looks to comes from the users own email account, it gives the appearance of being very convincing. In these cases very often you have set your personal email address as a “Safe Sender”, this is why it is not caught by spam software. Your Bank will never ask you for confidential information via emails, calls or text. Best to report these incidents to your bank. Phishing has become one of the main causes of security breaches. Once engaged you are literally hooked and at their mercy, your finances, your identity are now compromised and it takes a professional to rectify the situation. Additionally, for business owners a successful phishing attempt can potentially cause your domain to be blacklisted and deemed an unsafe sender and can lead to your email address being used to spam out more attempts to all of your contacts. This will discredit your domain's online reputation which leads to being blacklisted - results in your inability to use your domain successfully for emails until a technology professional cleans up the reputation of your domain. This can take weeks to remedy, in the meanwhile you are missing important work and personal emails and your daily processes and productivity has been halted, let alone the fact that your friends and contacts are receiving emails from you that you didn't even send. Depending on how vulnerable your contacts are, they might fall prey to the same tactics. It's a viscous cycle and you can help be part of the solution by educating yourself and others. If your email address has been spoofed, breached or if you have been a victim of a phishing scam and have concerns about your system or network, our team is happy to help. For information on how to secure your data and protect your domain reputation, contact a member of our sales team today by calling 949-699-6619 or email us today. If you found this article helpful please share it with your friends on Facebook or Twitter.